Prague, the capital of the Czech Republic located on the banks of the Vltava River is touted to be one of the most beautiful cities in Central Europe today. 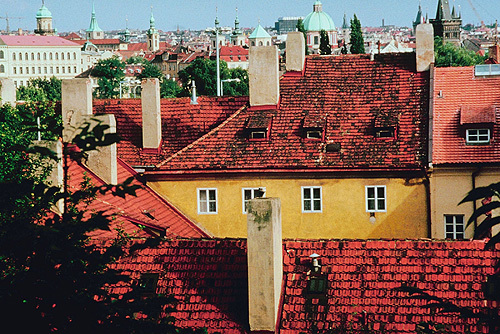 Tourist visits to Prague have grown in leaps and bounds in recent years. Fascinating historical events have led to the present day evolution of Prague as a tourism magnate. During the Second World War, Prague and the rest of the country was occupied by the Nazis, soon after the war ended in 1945, the Communist Party came to power in the country by way of a coup d’état . In 1968, the secretary of the Communist party Alexander Dubcek seized control. He tried to establish a reign of liberalized socialism with a human face called ‘Prague Spring’ but this ended in 1968 when five member countries of the Warsaw Pact led by Soviet Russia invaded the country. The bloodless revolution of 1989 called ‘the Velvet Revolution’ led to the overthrow of the communist government and the first democratic elections were held in the country in 1990. Vaclav Havel was elected president of the country. However in 1992 Czechoslovakia split into two independent countries the Czech Republic and Slovakia due to growing nationalist tensions and Prague was declared the capital of the Czech Republic on January 1st 1993. Vaclav Havel was elected first president of the Czech Republic in 1993. The country joined the European Union in 2004. Though Czech is the official language of Prague, One can easily get by, speaking English or German, two other languages which are widely spoken and understood. The official currency is the Koruna which is made up of 100 haler. Plastic is accepted in Prague and other tourist centers but the country is primarily a ‘cash’ economy. ATMs called ‘Bankomats’ dispense local currency without charging commission and are becoming widespread in Prague. Prague enjoys agreeable temperatures with warm, wet summers when day temperatures hover around 73°F-74°F (23° -24°C) while the nights tend to be cooler at 51º -53ºF (10º -12ºC). During the winters, snowfall is rare but temperatures do fall below freezing point. Rains come to the city in the summer months of May to August. The international airport is located 19 km north west of the city center and is called Ruzyne International Airport. It is composed of two terminals and serves as a hub for the Czech national airline called CSA. The airport handles fifty carriers including a host of low cost European carriers and is one of the busiest airports in Europe today. The airport has all the amenities of a modern airport such as shops, bars and restaurants and bureaus de change as well as ATMS. Mobile phones are also available for hire in the Arrivals Hall of Terminal 1. Wireless internet access is available in both terminals of the airport and there are abundant facilities for long term and short term parking at the airport. The cheapest route to the city is by public bus #119.This bus route terminates at its terminus at Dejvická from where one can connect to the metro. Another bus #100 takes one to the subway station at Zlicín. One should take the buses only if one knows Prague well. The tickets for the local buses cost 20CKZ. One must procure exact change in Czech crowns before boarding a bus. The journey by public bus takes forty minutes to the city with many stops. An airport shuttle bus service called Cedaz also operates every thirty minutes from 5.30am to 9.30 pm. This takes passengers to all the way to the city center to the metro station Námesti Republiky. Fares for this bus are higher at 90 CKZ. Hotels provide a communal coach transfer as well. These are easier and much more convenient. Several private companies run private shuttle services such as Smart Shuttle, Prague Airport Shuttle and Prague Airport transfers. These shuttles operate usually for groups of tourists and generally charge 600CZK for groups of four. The rogue taxi drivers hanging around the arrival hall in Prague have a dubious reputation and are often unscrupulous in dealing with unsuspecting tourists. These Taxi drivers are notorious for taking a tourist on a round about route so as to extract the maximum fare and they should be avoided at all costs. A taxi company called AAA has a contract with Prague airport for pick ups and these taxis should be used. They charge 350- 700 CZK for the thirty minute ride to the city. It is best to negotiate the fare before embarking on the ride to the city. Prague has two international railway stations Hlavni Nádraží which is also know as Praha hl.n. and Nádraží Holešovice (Praha Holešovice). Train links exist to Berlin, Vienna and Budapest. Both these stations are on the C line of the metro system. The stations have facilities for changing money, left luggage and also a post office. Prague is connected by highways in the southwest and southeast to the borders of the Czech Republic. The network of highways is quite old and in poor condition. The South Western highway D5 leads to Germany while the South Eastern highway D1 is the oldest highway which leads to Bratislava in Slovakia and offers a connection to Vienna and Budapest. International buses connect Prague to various European cities. There are international buses which leave from the bus station at Nádraží Holešovice but the major hub for international buses is at the Central bus station at Florenc Krizíkova . It has an attached subway station. One of the best legacies of the Communist era is Prague’s efficient and inexpensive public transportation system. Metro stations exist all over the city and trams and buses also operate efficiently so one can avoid driving in a city where traffic is often gridlocked and horrendous. There a number of tourist initiatives such as the Prague Card with which one can use public transport for four days. It is valid on the tram, bus and metro. It also gives one discounted entry to more than 50 attractions and other discounts. It can be bought for 740 CZK at various locations in Prague. Students pay 490 CZK. Yet another pass such as this is the Original Prague Card – Prague Pass which gives one free access to public transport for the first 72 hours and return transfers from the airport to the city center. The transport system uses a system of ticket validation i.e. the tickets have to be stamped at machines outside the metro or in trams or buses. There are surprise checks by inspectors and if the tickets have not been validated one may have to pay hefty fines of 500CZK. A variety of tickets are available single use tickets with transfers allowed within a time limit and passes which can be used for unlimited rides and bought for a day’s use, a three day use, a weekly use or a fortnightly use. Tickets can be bought from machines at metro stations or newspaper kiosks. The city of Prague is served by three metro lines which are called the A (green line), the B(yellow line) and C(red line) . The metro operates from 5am to midnight with a frequency of 2 to 6 minutes. There are 24 tram way lines that serve the city. The most popular trams used by tourists are the tram nos. 23 and 24 and they traverse important sights such as the National Theater and the Prague Castle. Regular buses and trams run from 4.30 am to midnight. There are some night services though which run hourly. The funicular railway runs on the picturesque route of Petrin Hill every 15 minutes from 9.30 am to 11.30 pm. The travel passes can be used on it or a single ticket has to be purchased for 20 CZK. Hailing a taxi in the street can be a recipe for disaster given the reputation of Prague’s taxi drivers. If you must use a taxi ask your hotel for a referral and ask them to call a taxi for you. Even then negotiate a rate with the driver and have it written down Some of the reputable taxi companies are AAA Taxi, Profi Taxi and Sedop. 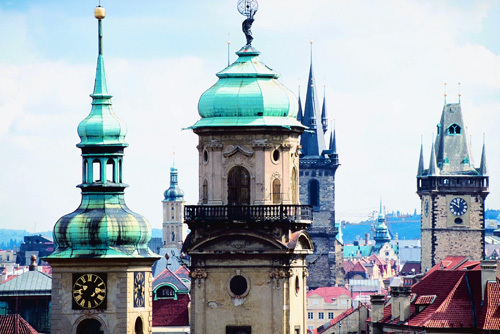 All the major international rental car agencies such as Europcar, Hertz, Budget have a presence in Prague. There are local agencies as well such as CS Czechocar and Seccocar. It is not worth renting a car and driving in Prague because of the horrendous traffic but if one wants to drive out elsewhere in the country it is convenient. One must have an international drivers permit as well as international insurance to drive in the Czech Republic. A few luxury hotels exist in Prague amongst these is the Four Seasons hotel which is conveniently located on the Vltava River next to Charles Bridge. This luxurious hotel makes a good base to see the sights of the Old town and affords a wonderful view of the Prague Castle. The Four Seasons website www.fourseasons.com can be accessed for availability and price. Another great hotel is the Savoy it is managed by the same group that runs the Palace hotel on Wenceslas Square. The Savoy has an old world charm about it and it can be accessed at www.hotel-savoy.cz. It boasts of an excellent restaurant as well called the Hradcany. A more reasonable hotel catering to the business community is the Prague Marriott Hotel Itt has all the amenities which would please a business traveler. The Prague Marriott can be accessed at www.marriott.com. Hotel Loreta is a cheaper but charming option housed in a building which dates back to the fourteenth century. The rates and availability for this hotel can be accessed at www.hotelloreta.cz. Prague doesn’t have a pulsating nightlife like other European cities but it does have some excellent restaurants and cafes. Allegro at the Four seasons Hotel is an exquisite Italian restaurant. Café Savoy at Vitezna is an Art Nouveau Café which serves hearty fare at communist era prices. It has been renovated twice in recent times but the food and the great service remain unchanged. Noodle bar located at the end of New Town serves good Thai food while Perpetuum at Na Hutich serves Czech fare which has been fused with French cuisine and a good selection of Czech wines.